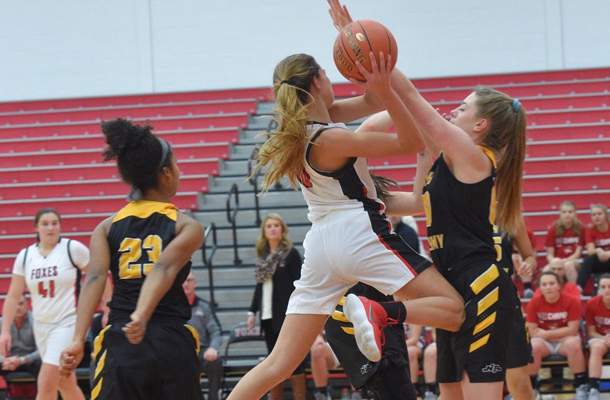 After suffering through a tough 2017-18 season, the Fox Chapel girls basketball team has bounced back in a big way. Coach Jennifer O’Shea’s team finished 9-13, including a 2-8 section mark, last season and failed to make the playoffs. This season, they clinched a playoff berth with two weeks left in the regular season. As of Feb. 7, they were 13-6 overall and 8-5 in Section 1-6A with one section game left. Those returning starters are senior forward Meg Friday and junior guard Gabby Guerrieri. The 6-foot-1 Friday has grabbed 122 rebounds with 58 of them coming on the offensive end. Guerreri leads the team in scoring at 9.0 points a game. She’s also made 14 3-pointers to go with 24 assists. “Gabby is a point guard, and we’ve needed her leadership out there,” O’Shea said. Sophomore Ellie Schwartzman, who averages 8.9 points, leads the team with 164 rebounds including 50 off the offensive glass. Junior Claire Fenton leads the team with 27 3-pointers and has an 8.3 scoring average. Sophomore guard Domenica Delaney has 20 3-pointers and averages 8.7 points. O’Shea felt the team was more than capable to make a turnaround. O’Shea has seen that improvement throughout the season. She also feel the depth of this team has helped the turnaround.